Lars Much is chairman of JP/Politikens Hus. 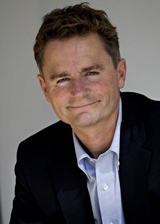 From 1999 to 2014, Munch was CEO of JP/Politikens Hus A/S. Before that he was a director at the Bonnier Group. In addition to chairing JP/Politikens Hus he currently chairs the boards of Louisiana Museum of Modern Art, BRFfonden and SOS Children’s Villages Denmark. The Board of Directors of the Novo Nordisk Foundation recently elected Munch as a member of the Board as well. Much is board member of the European Press Prize.